I SHOULD BE DESERVING TO BE TO MARS: C is a passing grade, right? Sometimes I'm a good parent. Sometimes I'm a bad parent. Most the time I land somewhere in the middle at "okay parent." Like yesterday. I thought, "Ivy needs to learn colors." The good mom in me decided," I'll make laminated flash cards with drawings of familiar objects in corresponding colors." The bad mom in me said, "Ha. You fool. That's never going to happen." So the okay mom in me purchased a color-learning ninety-nine cent app on the iPad. Could I do better? Yes. Could I do worse? Yes. Earlier this week temperatures rose above 60 degrees and the entire town acted like they'd never seen the sun. So many, too many, white legs in shorts. 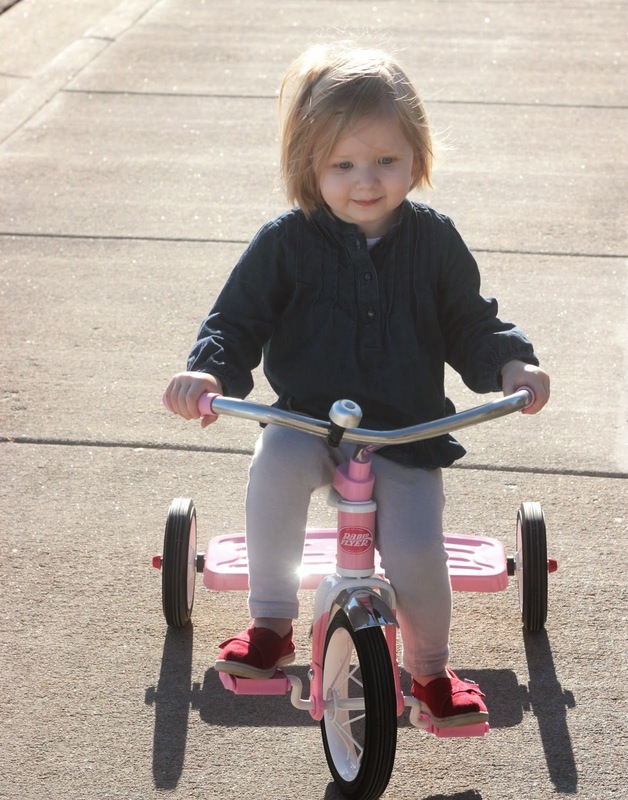 I too came down with Spring Fever and thought, "I should take my dear, sweet child outside to ride her tricycle." But then the bad mom in me was like, "Ugh. 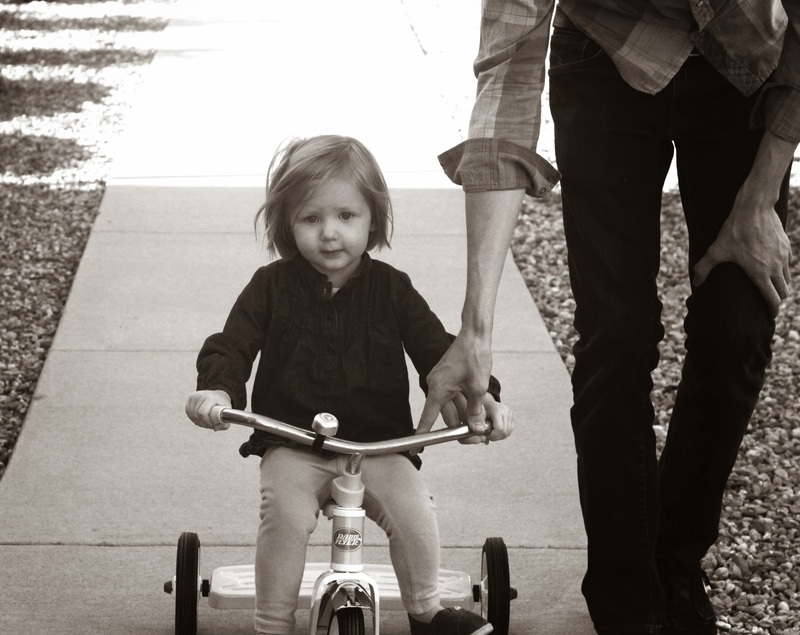 I'd have to carry the trike down one flight of stairs." 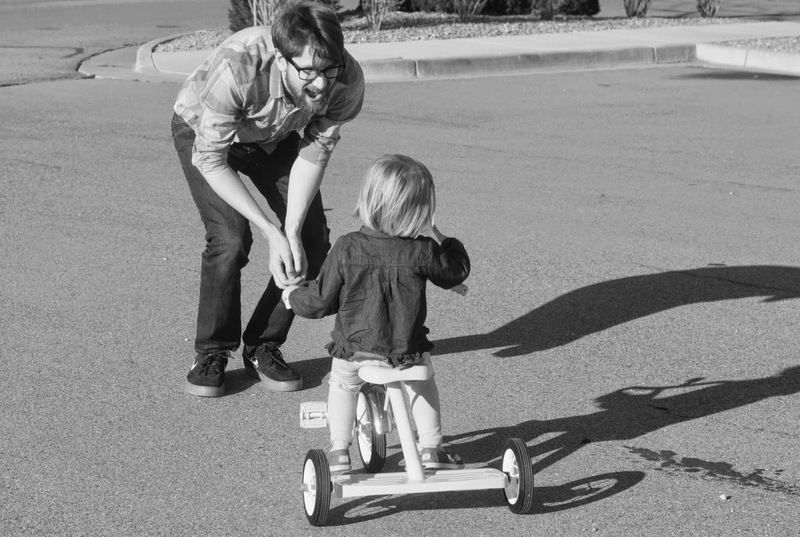 The okay mom in me waited for Stephen to return home from school, handed him the miniature bike and said, "We're going for a ride." We've been married for a while now, so Stephen knew my statement actually meant, "You'll be doing the actual parenting while I fill up an entire memory card and any remaining phone storage with photos." Maybe it was still a bad mom move, but these lines are not finite, and sometimes success just means falling above Call Social Services on the spectrum. Besides, who else was going to take seven thousand photos? Luckily, Stephen is a good dad, always. This last photo is inexplicably sepia-toned. I'm registered for a photoshop class in June. Once I become a PS Wizard, the internet will no longer have to endure my hack-editing jobs.